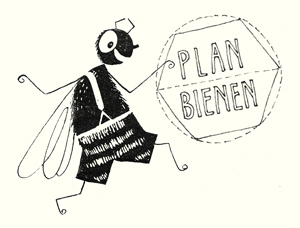 Plan Bienen is an ongoing collaborative interdisciplinary research project led by Tessa Zettel and Sumugan Sivanesan. It was begun during a 3-month residency at ZK/U – Centre for Art and Urbanistics, Berlin in 2014, and developed further in partnership with Art Laboratory Berlin in summer 2015. Plan Bienen investigates urban beekeeping in relation to dual crises in European economic systems and bee ecologies, within the context of Berlin’s post-reunification development as a multicultural ‘creative’ capital. Using the histories and current growing popularity of city bees as an entry point, the artists have been mapping post-monetary economies, forms of exchange and emergent sociabilities occurring across Berlin’s food systems, intercultural gardens, migrant networks, hackerspaces and hausprojekts, speculating on the kinds of futures these little freunden und freundinnen might lead us towards. Outcomes so far have included exhibitions, events and artist talks (Art Laboratory Berlin, 2015; ZK/U Berlin, 2014), presentations at symposia (Aesthetics After Finitude, Sydney, 2015), and journal articles (un Magazine, 2015). Get in touch if you would like to connect with them. Its 2015 iteration is supported by an Australian Artists’ Grant.